Nothing brings a group of people together like a round (or ten) of drinks. Whether it is a long-awaited gathering amongst a group of friends, a post-work unwinding session with your colleagues or just simply cracking a cold one with the boys (or girls), a little bit of booze to go with the bantering has always been the perfect way to bond. 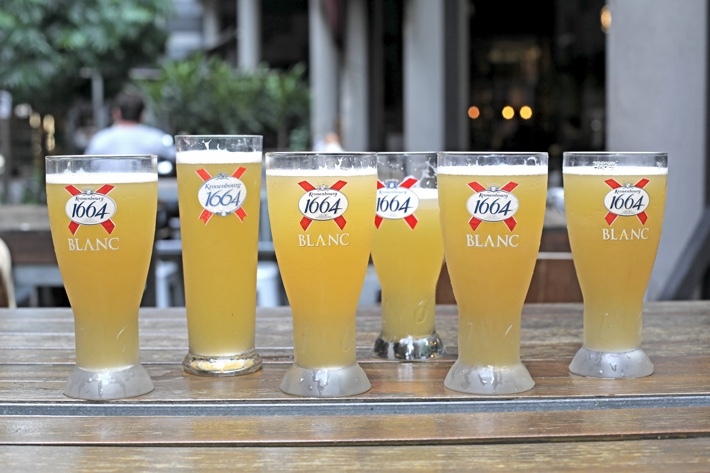 Oriole Coffee + Bar recognises that and will be having an all-day promotion for Kronenbourg Blanc from 1 April to 31 May 2019, where each pint will be going for just S$10 nett, all day long. This gives you even more reason to destress and have a mid-day drink with some friends! If you’re planning to go in a large group, we have even better news for you! From 1 April to 31 May, if you dine in groups of 5 and above, you will receive a non-alcoholic welcome drink with every main ordered when you pay with Mastercard. Take this as a sign for you and your pals to finally have that much-needed meet-up session! Do note that both promotions are not valid with any other discounts or promotions. 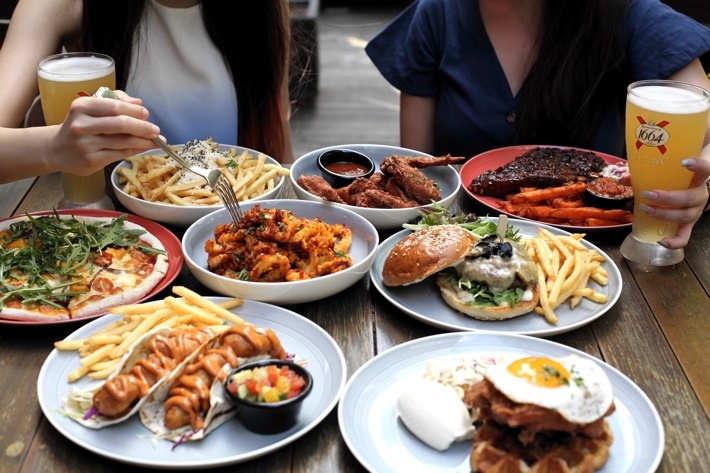 One thing that we really love about Oriole Coffee + Bar is how they have a number of dishes that are great for sharing. That definitely includes their extensive range of finger foods that go incredibly well with a pint of ice cold beer! Whether you’re looking for a fried-chicken-with-beer combo or just wanting one of Oriole’s signature light bites, Har Cheong Gai (S$16++) would be your best bet. 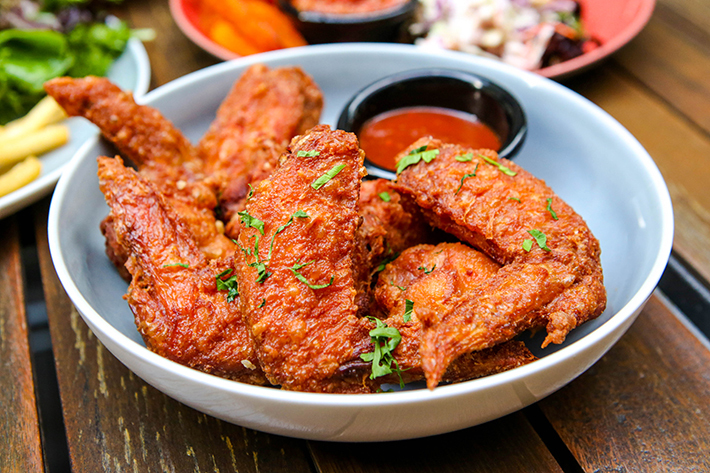 Shrimp-paste marinated chicken wings are fried to a lovely golden-brown crisp and served with a saucer of sambal belacan that is very mildly spicy. A staple finger food that can hardly go wrong is Truffle Fries (S$14++). 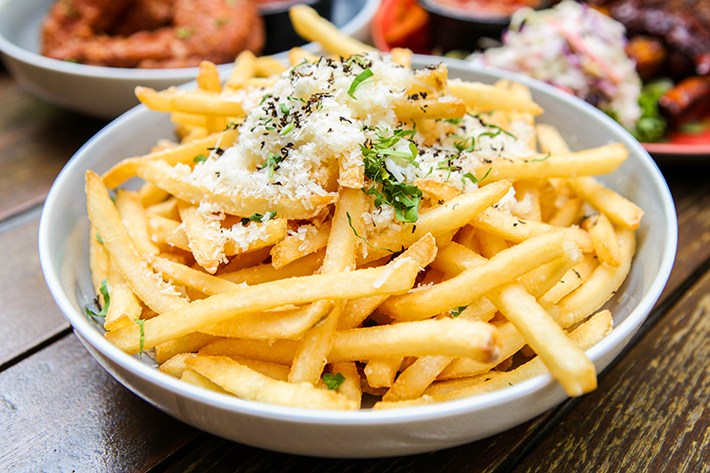 Liberally sprinkled with salt, truffle oil and shaved parmesan cheese, it’s one addictive bowl of crispy shoestring fries that you’re going to have to share as much as you might hate to. 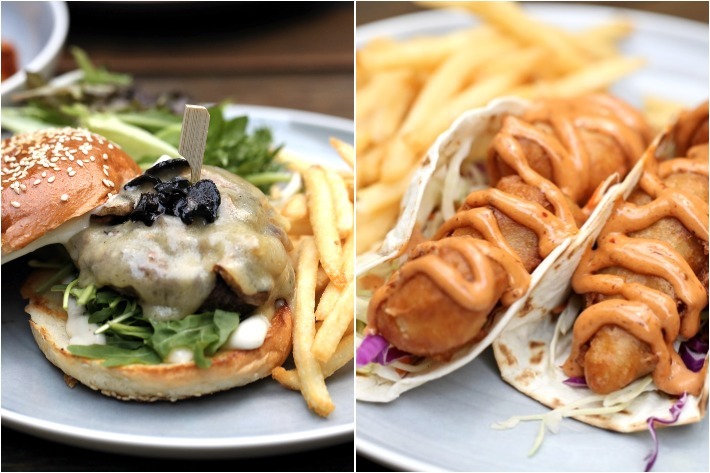 Aside from finger food, Oriole Coffee + Bar’s extensive menu has a plethora of other scrumptious dishes that are great for sharing among friends. 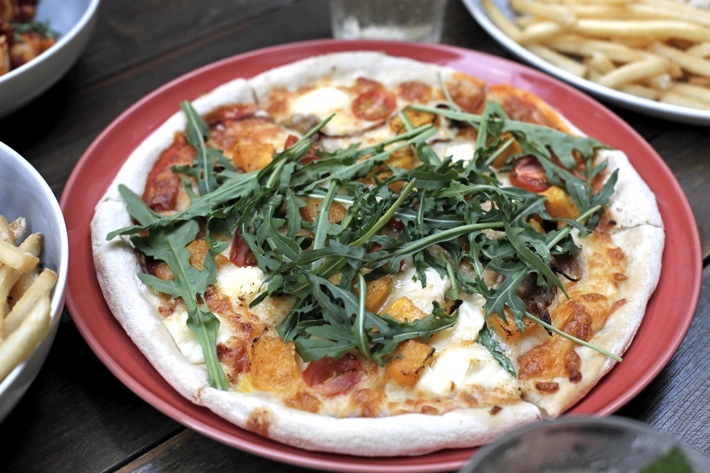 With mouthwatering options such as Philly Cheese Tenderloin Sandwich (S$22++), Cubano Meatwich (S$18++) and Triple Cheese Pizza (S$18++), you will definitely be left spoilt for choice. If you can’t make up your mind, we recommend getting the Pumpkin & Feta Cheese Pizza (S$20++) which features an assortment of delicious and fresh-tasting meatless toppings such as roasted pumpkin, arugula, feta cheese, tomatoes and caramelised onion that are scattered generously atop a hand-pulled dough base that has been stretched to delicate perfection. 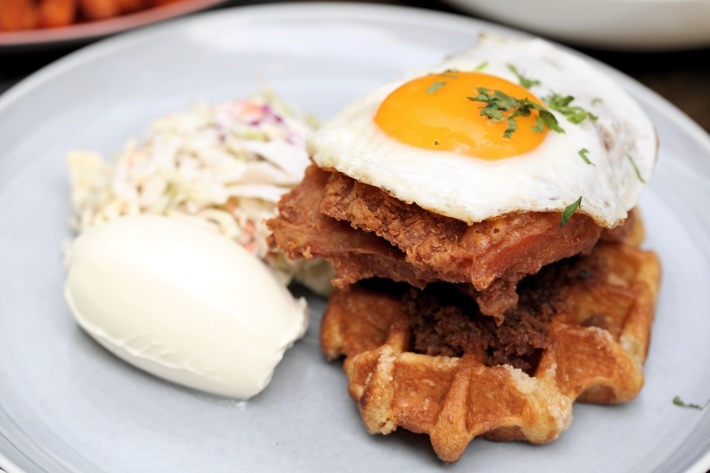 For something that best encompasses sweet, savoury, soft and crunchy, you can opt to have their Chicken & Waffle (S$18++). The freshly made waffle is slathered with a savoury bacon jam and arranged neatly atop, is a massive slab of crispy fried chicken as well as a fried egg. The dish comes with a side of crème Fraiche which adds a subtle tartness and creamy indulgence when eaten together with the chicken and waffle. The Oriole Truffle Burger (S$22++), which comes with a side of fries, has a mild truffle fragrance that immediately hits you as you take your first bite. Sandwiched between fluffy brioche buns is a stack of juicy grilled grain-fed beef patty, sautéed mushrooms, caramelised onions, melted cheese, truffle aioli, and tossed greens. Although the beef patty could have had a stronger meaty flavour, the rest of the ingredients made up for it. If you prefer something from the ocean you can always opt for the Fish Tacos (S$22++) which are essentially battered red snapper fillets and red cabbage slaw encased in a lightly toasted taco shell. The fork-tender red snapper was encrusted in a crisp, golden brown exterior that let out a satisfying crunch when we bit into it. 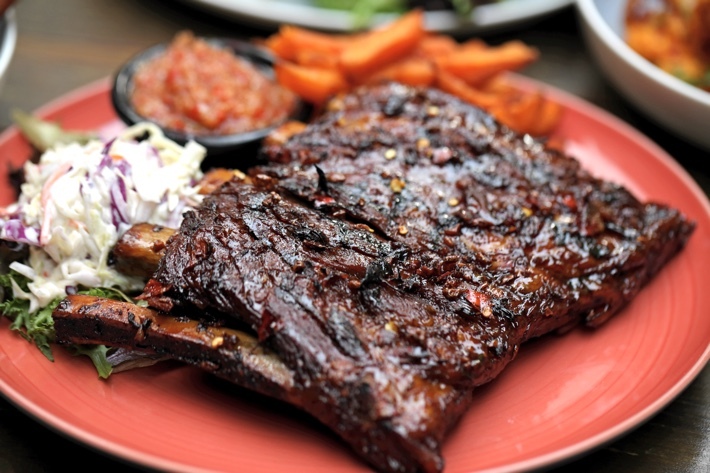 For heavier meats, St. Louis Pork Ribs (S$30++) is a half-slab serving of BBQ ribs with sweet potato fries and crunchy purple cabbage slaw. The pork was tender soft and we easily pulled it off the bone. The coat of sticky kecap manis (Indonesian sweet soy sauce) wasn’t too sweet and didn’t overwhelm the pork. The saucer of chilli relish it came with was a tad citrusy, lifting the heavy flavours of the ribs. 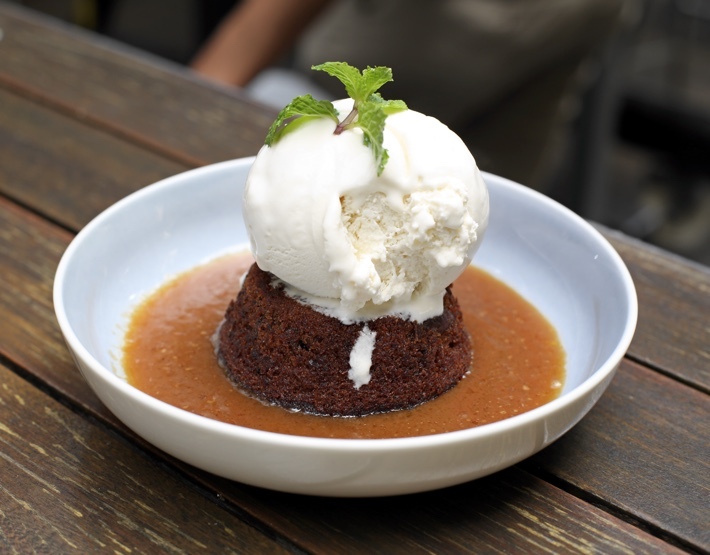 We sang nothing but praises for their ambrosial Sticky Date Pudding (S$12++) which was the perfect way to balance out the savouriness of the other dishes. The dense pudding that lay in a pool of saccharine toffee sauce was served warm and in contrast, it was finished off with a dollop of ice cold ice cream from Cold Stone Creamery®. This ambrosial dessert sees a dense pudding sponge, placed in the middle of a plate and surrounding it is a moat of warm, velvety toffee sauce. Indulgent, and we dare say, sinful, this dessert is finished with a huge scoop of fresh vanilla ice cream over top. The ice cream sparks a lovely contrast with the warm pudding and toffee sauce, giving you an interesting burst of sensations and flavours with each spoonful. We highly suggest that you start on the dessert once it hits the table as the warmth from the pudding makes the ice cream melt fast. With its inviting atmosphere, central location, fantastic food and wallet-friendly drinks, what is there not to love about Oriole Coffee + Bar? 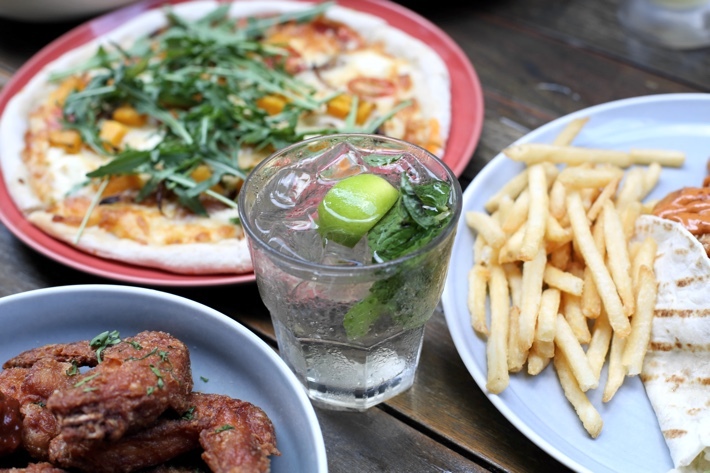 A one-stop cafe located smack in the heart of town where the qualities of great brunch-style nosh, good vibes and affordable drinks cohesively intertwine, Oriole Coffee + Bar is where it’s at if you’re looking for a memorable night out with your pals. 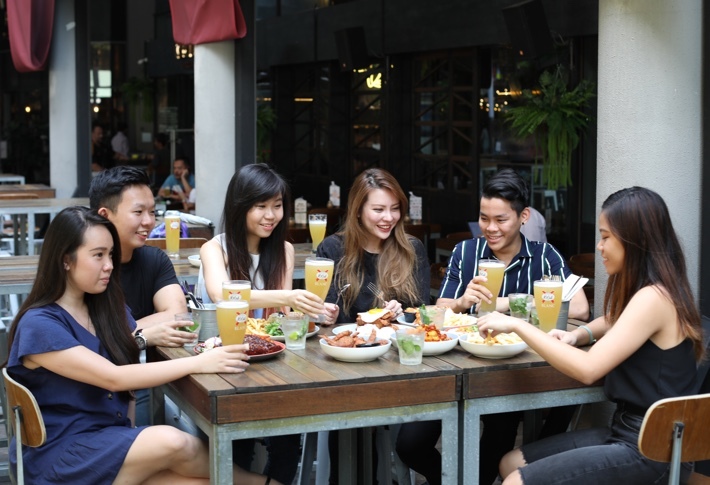 If you’re planning to head down anytime soon, remember to take full advantage of their S$10 nett per pint Kronenbourg Blanc promotion as well as bring along a big group of friends to get your hands on some of those welcome drinks! This post was brought to you by Oriole Coffee + Bar.